Absolutely gorgeous Rita! I love your colour choices and that bow is so beautiful. The dsp and embossing look wonderful together too. Rita this card is too too cute! I love the color combo, feels warm and cozy. I really like the embossed strip that grounds the whole theme. OMGoodness, how cute. I would never have thought to use the embossing folder and cut a strip from it like that! I now have a new idea for my next stamp camp! Hi Rita! The embossed strip behind the snowman is such a cute touch! I love this guy too. It IS "snow much fun". Love the way you placed the sentiment on the decorative label die too. These colors are rich and wonderful! Your snowman looks great against such a fab setting! And how clever are you to emboss snowflakes on the narrow strip!?! Adorable! very nice card, the snowman is great but the little bird is adorable. Rita, this is the most fabulous color combo. Absolutely perfect for your snowman stamp and I'm totally going to steal it because I plan on making lots of snowman cards this season! And I LOVE how you used the snowflake embossing folder on the vertical layer. Genius! What a super cute card Rita ... 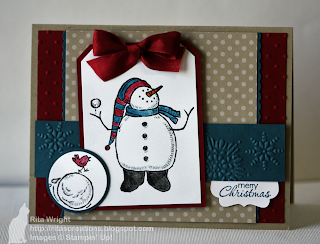 I love that little snowman and I love your colouring ...the colours and the textured border are so so pretty, a fabulous combination and an equally fabulous card!!! Rita, this is adorable!! I love this color combination and the embossing textures are just stunning! What a lovely Christmas card, full of happy! The smiley face on the snowman is sure to put a big smile on the recipient's face! Beautiful! I love the rich colors you used and your shading really makes everything pop!